The Los Angeles Rams were no match for Tom Brady and the Patriots who were victorious in Super Bowl LIII. ATLANTA, GA—The New England Patriots defeated the Los Angeles Rams, 13-3, in Super Bowl LIII from Mercedes Benz Stadium on Sunday, February 3. The Patriots dynasty continues, as Patriots Quarterback Tom Brady and crew celebrate their sixth SB victory in franchise history. The Patriots defense dominated the Rams offense all afternoon, holding them to a measly 3 points. Rams Running Back Todd Gurley was ineffective, with only 35 yards on 10 carries. Rams QB Jared Goff was never able to get into a rhythm, thanks to a swarming rush which knocked him around the entire afternoon. Goff went 19 of 38, 227 yards and a devastating interception late in the fourth quarter, as the Rams seemed poised to even the score. Super Bowl MVP, Patriots star Julian Edelman, hauled in 10 catches for 141 yards. It was a lackluster Super Bowl, with the lowest scoring game in history. The Rams failed to score a touchdown, the first time all season. The game was going almost nowhere, stuck at 3-3, deep into the fourth quarter when Tom Brady, who won his record sixth championship, finally got hot. The two big strikes though were classic Gronk, a bruising over the shoulder catch and run for 18 yards and then another for 29 that put the Pats on the goal line. The Rams countered with their best drive, as Goff found Rams Wide Receiver Brandin Cooks. Unfortunately, an interception by Stephen Gilmore near the goal line was the Rams final gasp. It was a defensive showcase by both teams with the score at a standstill going into the fourth quarter. 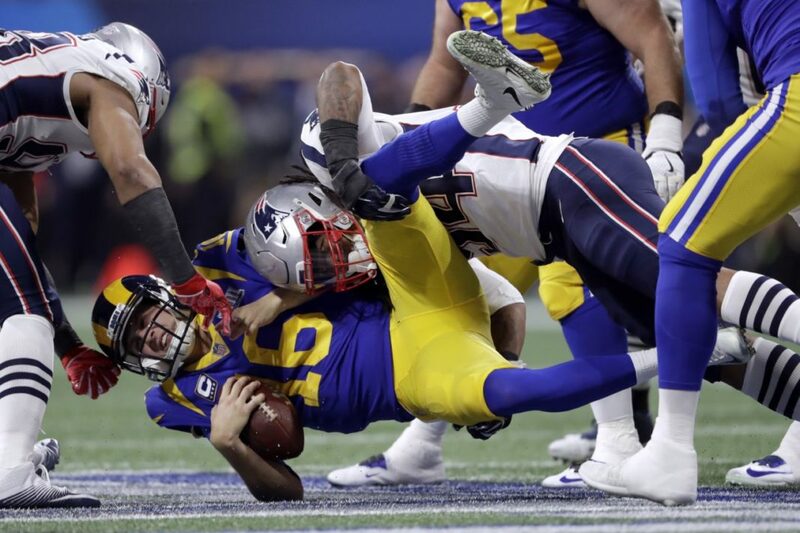 It was a lackluster performance from the Rams, although the lion share of praise belongs to the Pats defense. Another Super Bowl for the greatest dynasty in NFL history.